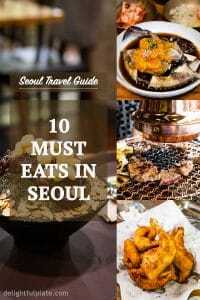 In this Seoul food guide, I will share with you the ten must eats in Seoul. We just had ten exciting days in Seoul and the best part of the trip was definitely exploring the amazing food scene there. This is by no means a definitive list of must-try foods in Seoul. I’m sure we will be visiting Seoul again in the future because I already miss the food there. In that case, we will try more mouthwatering dishes and update the post with new information. 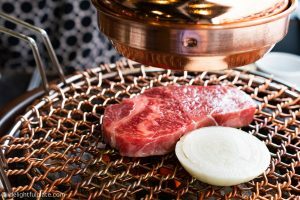 In this post, I will do my best to explain the dishes we recommend and why you should try it in Seoul. What is Korean barbecue: it is the Korean way of grilling meat. The meat is often grilled on a gas or charcoal grill built into the dining table and the servers will grill the meat for you at your table. Why you should try Korean barbecue in Seoul: Korean Barbecue is already famous outside of Korea. We had it a number of times in the US, and I was wondering if it could get any better in Seoul. And it could! The reason is I feel that the meat quality in Seoul is better for grilling than the one in the US. The hanwoo (Korean beef) has beautiful marbles and high-fat content. Once grilled, it is so tender and juicy. You can usually order different types of cuts, marinated or not marinated meat. Pork belly is also a popular choice. We tried Jeju black pork belly which was delicious. It seems that some barbecue places require customers to order at least two servings of each type of barbecue meat. Some places, such as the Maple Tree House, don’t require that and I personally prefer places that give me full freedom to order whatever I like to try. 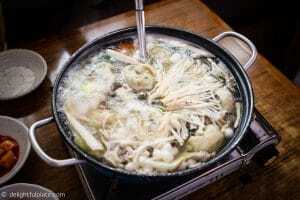 What is samgyetang: samgyetang is Korean ginseng chicken soup. They stuff a whole young chicken with sticky rice, ginseng, chestnut, and jujube dates and simmer until tender. Why you should try samgyetang in Seoul: It is a very delicious, nourishing and comforting soup. In addition, Korean ginseng is famous all over the world for its quality and health benefits. There’s no better place to eat samgyetang other than in Korea. Don’t expect this soup to be strong or flavorful like kimchi soup though. It’s on the lighter side and when you eat, you can pick out the chicken meat and dip with salt to taste. Please excuse our terrible quality photo above. It was a bowl of samgyetang at Tosokchon, a popular samgyetang restaurant in Seoul. I promise that it tastes better than it looks in my photo. This is another famous Korean dish that you definitely want to eat in Seoul! 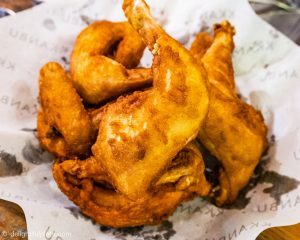 Why you should try Korean fried chicken in Seoul: you will find that the chicken here is smaller than your regular fried chicken in American, resulting in tender and flavorful meat. The fried chicken we had at Kkanbu Chicken in Seoul was well-seasoned and crispy without being overly greasy. You will have a lot of options to choose from, breaded or no breaded chicken, with sauce or no sauce, spicy or non-spicy. Local people seem to love eating fried chicken with a (or a few) glass of beer. What is gamjatang: gamjatang is a spicy pork bones soup. 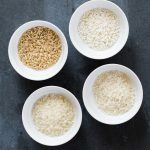 It also contains other ingredients including potatoes, glass noodles, perilla leaves and rice cakes. Why you should try gamjatang in Seoul: this hearty and comforting soup is a must eat in Seoul because it has so many layers of flavors. Eating it is also quite fun. You will need to use chopsticks to pick out the meat when eating. Great time to practice chopstick skills! We had this delicious soup at Onedang Gamjatang for breakfast twice when we were in Seoul. I actually found it to be a great dish to wake all your senses up for the day. Speaking of breakfast, Korean cuisine doesn’t have a “breakfast foods” category like other cuisines. Korean people just have the same type of food they eat in other meals for breakfast. What is mandu: mandu are Korean dumplings and can be cooked in different ways (for example steam, boil or fry). The ones we tried at Gaeseong Mandu Koong had a delicious filling made from pork, ginger and chives. I find mandu to be comforting and fulfilling, especially when served in a hotpot. Why you should try mandu in Seoul: I’m not sure about other mandu restaurants but the mandu at Gaeseong Mandu Koong is so fresh and tasty. They have a workstation by a window near the restaurant entrance where we watched two ladies wrapping the mandu skillfully. What is galbitang: here’s another well-known Korean dish outside of Korea, galbitang. Galbitang is a clear soup made with beef short ribs and daikon radish. 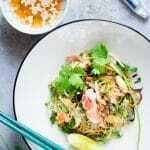 It also contains other ingredients such as glass noodles and green onions. 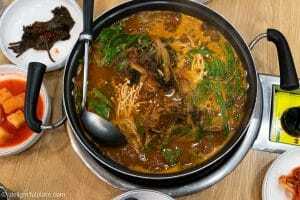 Why you should try galbitang in Seoul: this is my most favorite Korean soup so to me, it’s a must eat in Seoul. The soup has a natural sweetness from simmering beef short ribs and radish. It is comforting and heart-warming without being heavy, and the short ribs are so tender after long hours of simmering. I really liked the galbitang at Hanilkwan in Seoul. Their galbitang has a very clear broth with a subtle herbal fragrance which I’ve never seen at Korean restaurants I tried in the US. I was quite hesitant to include ganjang gejang in this guide since I don’t like it, to be honest. However, it’s a famous dish in Seoul and everyone’s taste is different, so I decided to list it here. 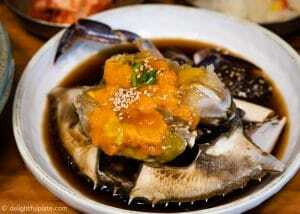 What is ganjang gejang: ganjang gejang is marinated raw crabs in soy sauce. The crab meat becomes sweet, soft and flavorful after being marinated for long hours (or even a few days). Why don’t I like it? Firstly, I don’t quite like its soft, gelatin-like texture. Secondly, I can’t quite deal with the idea of eating raw crabs. I kept thinking about risks of food poisoning, but Korean people have been eating this dish for ages, so it must be safe I guess. What is bingsu: bingsu is a Korean shave ice dessert with sweet toppings such as red bean, fruits, rice cakes and sweetened condensed milk. 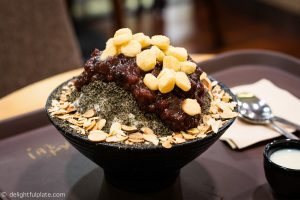 Why you should try bingsu in Seoul: I got addicted to it when we were in Seoul, so I ate it almost every day. It’s not too sweet and is usually refreshing with contrasting flavors and textures. If you travel to Seoul in the summer, the heat and humidity can wear you down quite quickly. A bowl of bingsu can cool you down and relieve your thirst. There are many types and different flavors for bingsu so you won’t get bored of it. Among all the flavors we tried, the black sesame red bean bingsu at Sulbing cafe was the best. 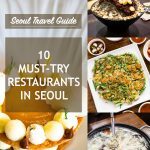 Why you should try elevated Korean foods in Seoul: before our trip, I always wondered how Korean foods could be elevated. How can one create an elegant version of comforting Korean dishes? If you also wonder the same thing, try one or two fine dining restaurants that serve modern Korean cuisine in Seoul to see how talented Korean chefs take Korean foods to a new height. We had interesting and tasty meals at Mingles and Jungsik in Gangnam area. 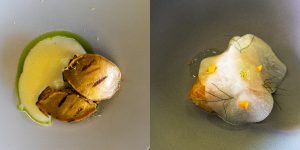 The food was beautiful and creative, featuring Korean ingredients and techniques as foundations. I knew very little about Korean street foods before our trip. As a result, I was surprised to see an array of street foods that look interesting in Seoul. Myeongdong is a hot spot for street foods besides shopping. 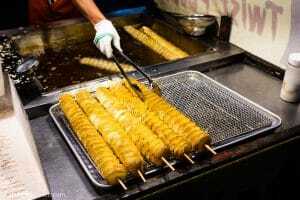 Every night, vendors set up carts to sell street food snacks and you will see them cook/prepare the food on the spot. I will admit that we didn’t try anything there and Myeongdong is very crowded at night. However, it was pretty fun to see vendors making the food. Some of the snacks that stand out to me were tornado potatoes, tteokbokki (spicy rice cakes) and 32-cm long ice cream. For each of the food above, I already mentioned where we had it in Seoul. If you want to read more about my meals at those places as well as other must-try restaurants in Seoul, check out my 10 Must-try Restaurants in Seoul post. To find the addresses of these restaurants, you can use Google, Naver app or Visit Korea website which has addresses in both English and hangeul (Korean alphabet). Taxi drivers most of the time only understand addresses written in hangeul.